WASHINGTON, DC, December 29, 2015 (ENS) – President Barack Obama Monday signed into law a bill phasing out the manufacture of facewash, toothpaste and shampoo containing plastic microbeads by July 1, 2017 and the sale of these products by July 1, 2018. The Microbead-Free Waters Act (H.R. 1321), introduced in the House by Congressmen Frank Pallone, a New Jersey Democrat, and Fred Upton, a Michigan Republican, and by Senators Kirsten Gillibrand, a New York Democrat, and Rob Portman, an Ohio Republican in the Senate, was unanimously approved by both chambers earlier this month. Microbeads are minuscule scrubbers found in cleansers, body scrubs, and toothpaste. On their own, they are nearly invisible, smaller than a pinhead. But once they go down the drain, problems begin. 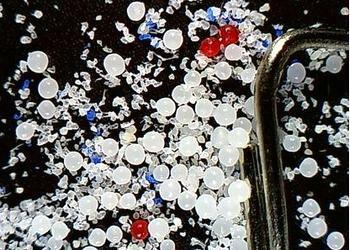 Plastic microbeads, designed to be washed down the drain and too small to be reliably captured by wastewater treatment facilities, pollute lakes, rivers and oceans. One tube of exfoliating facewash can contain more than 350,000 microbeads. Some 2.9 trillion microbeads are estimated to enter U.S. waterways annually. The types of plastic most commonly used as microbeads are: polyethylene, polymethyl methacrylate, nylon polyethylene terephthalate and polypropylene. Microbeads are known to absorb pollutants and are often mistaken as food by fish and wildlife. Once in the environment, plastic microbeads concentrate toxins such as pesticides and flame retardants on their surfaces. These toxic substances may then transfer to the tissue of fish that mistake microbeads for food. A recent study found that one-quarter of fish purchased at California markets had ingested plastic. Lakes Erie and Ontario have the highest concentrations of microbeads of any U.S. waters. A report by scientists from the State University of New York found Lake Erie averaged about 46,000 particles of plastic per square kilometer, compared to about 6,000 to 8,000 particles over the same area in lakes Superior and Huron and about 17,000 particles in Lake Michigan. Following California’s landmark microbead ban enacted earlier this year, the Microbead-Free Waters Act bans all plastic microbeads from beauty products, including those made from so-called “biodegradable plastics,” as most of them do not biodegrade in marine environments. This legislation is supported by the Personal Care Products Council, the Alliance for Great Lakes, the American Chemistry Council, Revlon, Proctor & Gamble, Johnson & Johnson, the Plastics Industry Trade Association and the Consumer Healthcare Products Association. Melville said the timeline in the legislation ensures that manufacturers have enough time to remove microbeads from these products or identify and phase in alternative options. W.R. Grace & Co. already is offering an alternative made with odorless, tasteless, and chemically inert synthetic micronized silica. “Grace exfoliating silica gels do not bioaccumulate, are not biopersistent, and can be engineered to provide exceptional exfoliating properties,” the company said in a statement. Other alternatives are also in the works. In June, TerraVerdae BioWorks, an industrial biotechnology company headquartered in Canada with operations in the United States and the UK, announced a line of biodegradable, natural microspheres for use in personal care and cosmetic products, as a direct replacement for plastic microbeads that are the subject of restrictive legislation. Until the ban takes effect, avoiding products with microbeads is not difficult. Check ingredient labels for polyethylene and polypropylene. An app has been released which allows shoppers to scan a bar code with a smartphone camera to determine if a product has microbeads. The Beat the Microbead app is easy to use and informative. Download it for free here.